Do Architects Know Graphic Design? 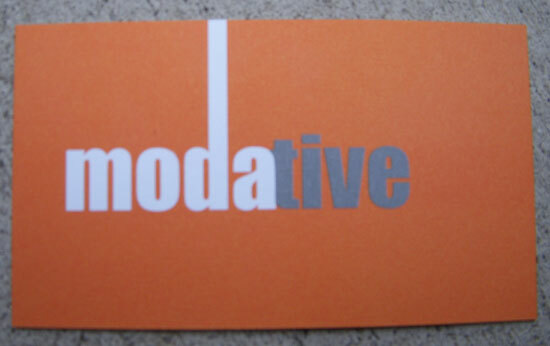 To us here at Modative, modern architecture is really more about a way of thinking than a style. It's about doing things better, even if it means abandoning old traditional rules. We carry this same critical thinking into the occasional graphic design assignment. An example of this recently occurred with our business cards. 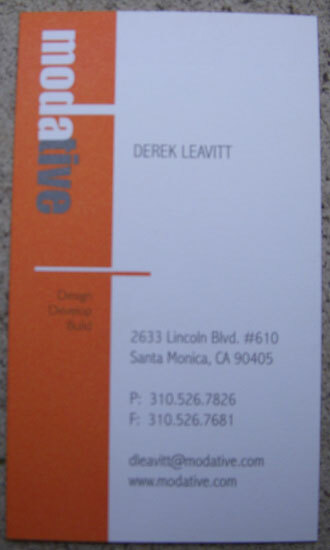 Four years after our initial order, a few of us were running low on business cards. The natural architect instinct is to redesign the entire card; however, since we're still happy with our logo and look, we decided on only a few minor modifications. Subtracting instead of adding - much like we would do in a building design - eliminating the unnecessary. No changes to the back of our business card. 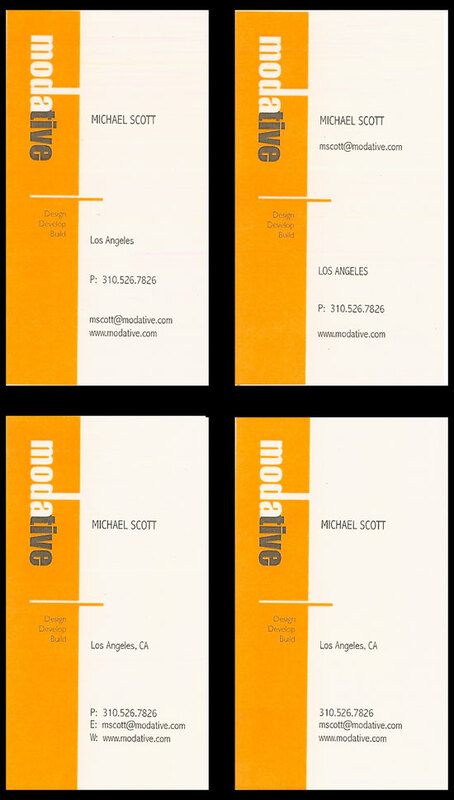 We like the bold simplicity and abundance of orange that screams "pull this business card out of the jar for the random prize drawing". The front of our old business cards. The first subtraction was an easy call: nixing the fax number. Honestly, we don't want faxes. We've contemplated eliminating our fax machine altogether. Anything that can be faxed can be scanned and emailed. We also considered removing our physical address. The physical address on our business cards has actually been the cause of confusion over the years because it listed our mailing address, not our office location. When we originally designed the cards, we did this intentionally, because we knew we'd move our office a few times in those early years. And we did. Go with no address or city and rely on people going to our website to find our two addresses. 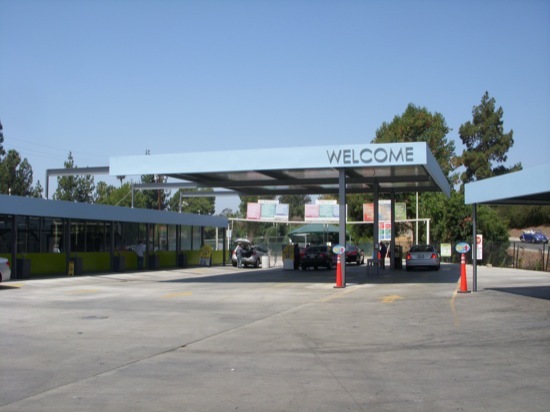 Variations of the "Los Angeles" Option. We didn't like the way "Los Angeles" looked on the card. It was as if we forgot the rest of the address. In the end we decided on Option 3: no address. People have much better access to the web than they did even four years ago when we first printed business cards and our website clearly provides both our office location and mailing address. 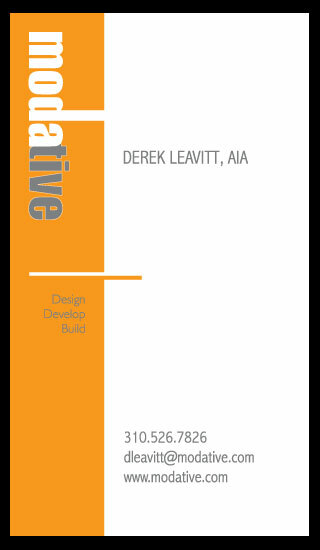 The new ultra simple business card sans fax and address. 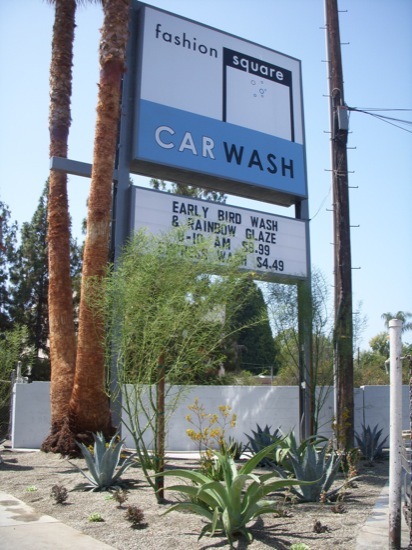 We enjoy graphic design, especially when it's integrated into the architecture, like the graphics work we did as part of the Fashion Square Car Wash remodel. New sign graphics designed by Modative. Simplifying the signs at the welcome canopy. The old cluttered welcome canopy. 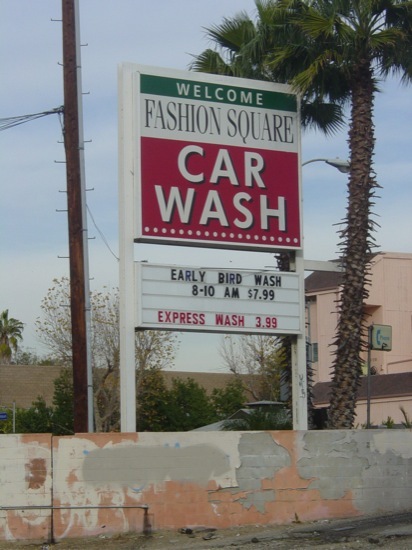 For the Fashion Square Car Wash, we designed all of the signs and graphics, including business cards, coupons and staff shirts. We've found that providing our clients with graphic design as part of our beyond architecture services provides for a strong consistency between the graphics and architecture, making for a successful project. Contributors to this post include Christian Návar, Michael Scott and Krystal Návar.